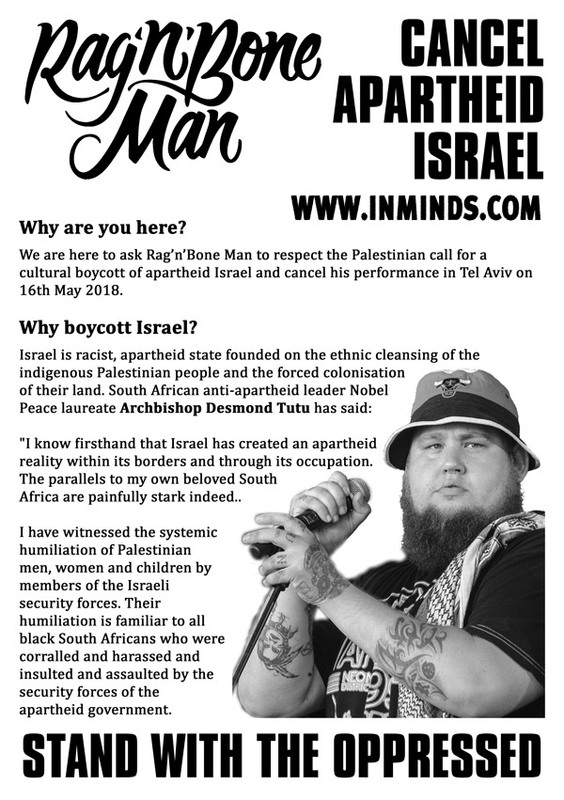 On 24th November 2017 Inminds human rights group will hold a vigil outside the O2 Academy in Brixton urging award winning English singer-songwriter Rag'n'Bone Man (Rory Charles Graham), who is playing inside, to cancel his scheduled performance next May in Tel Aviv and respect the Palestinian call for a cultural boycott of apartheid Israel. 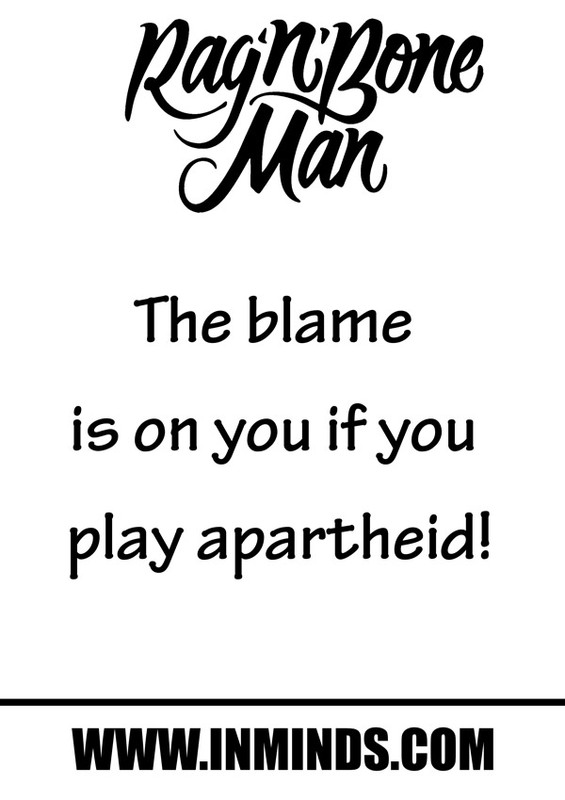 Rag'n'Bone Man is set to perform at Tel Aviv's Menora Mivtachim Arena which is built on the Palestinian village of Salama whose population of 7,807 was completely ethnically cleansed in 1948 by the Alexandroni Brigade of the Haganah terrorist organisation. This particular brigade is infamous for the massacre of the Palestinian fishing village of Tantura, with one soldiers boasting in his diary of the execution of Palestinians after the village had fallen: "our boys know the craft of murder quite well.." he wrote. Every building in Salama was razed to the ground, apart from 10 houses and the school buildings - 1,682 homes destroyed. Those that survived the attack were ethnically cleansed from Salama, forcefully made refugees that today number over 48,000. That ethnic cleansing of Salama was repeated right across Palestine with over 600 indigenous Palestinian towns and villages being wiped off the map, resulting today in 7.2 million Palestinian refugees. 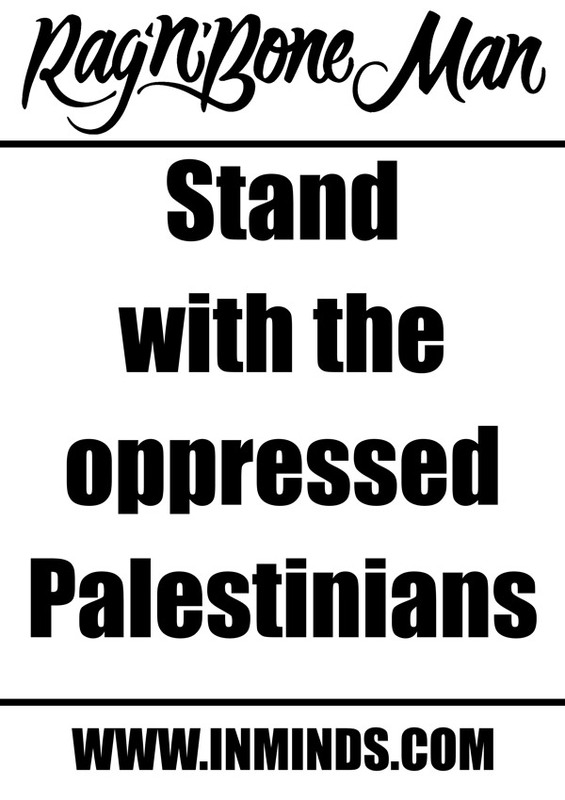 1 in 3 refugees in the world is a Palestinian. 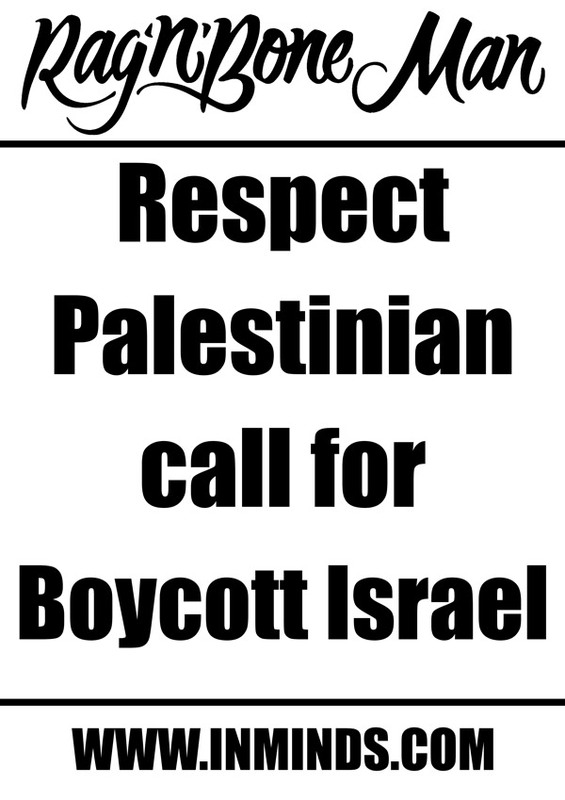 Israel's apartheid system denies them the right to return to their homes whilst guaranteeing any white European who can show a Jewish bloodline automatic citizenship and a right to live on stolen Palestinian land. 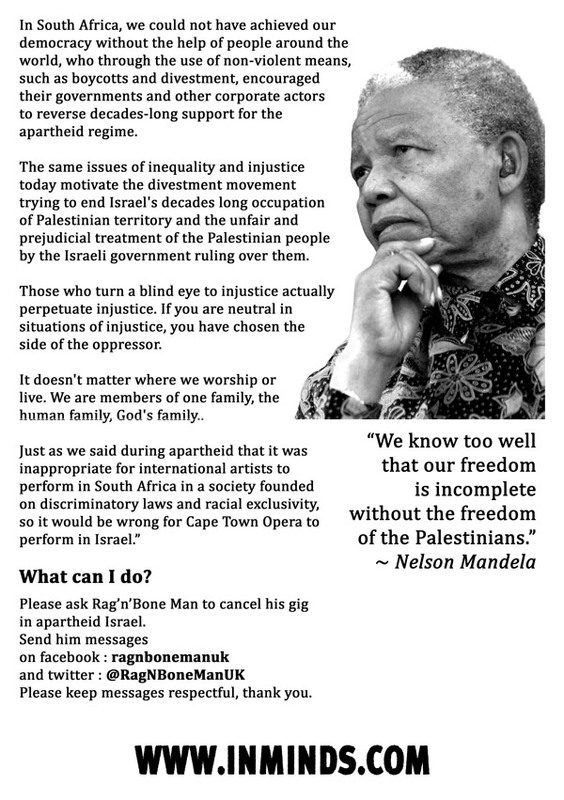 Whilst Rag'n'Bone Man performs to an apartheid audience, less than 40 miles away, over 2 million Gazaans are imprisoned under an illegal 10 year Israeli land, sea and air blockade. Documents from Israel's defence ministry revealed that Israel uses a meticulously calculated cold-blooded calorie count to limit food entering Gaza to enforce a starvation diet on Gaza where people are always starving but not quiet dead from starvation. 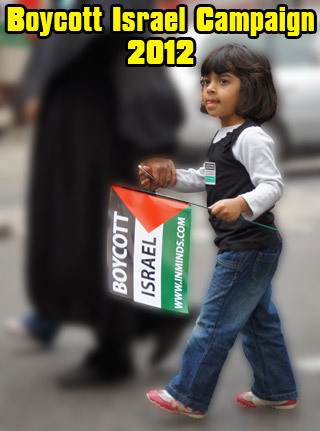 Over half of the people of Gaza are children under 15 years old. When hungry Gazaan's go fishing in their own waters, their boats are attacked by the Israeli navy and their fishermen are abducted. Israel sprays toxins over Gaza farm land to ensure no crops grow; and has imposed a 'no-go zone' across 17% of Gaza , much of it farm land - farmers are shot if caught farming their land. Oxfam reports that 96% of fresh water in Gaza is unfit for human consumption; and the United Nations reports that 72% of the households are food insecure, that by 2020 Gaza will become uninhabitable. 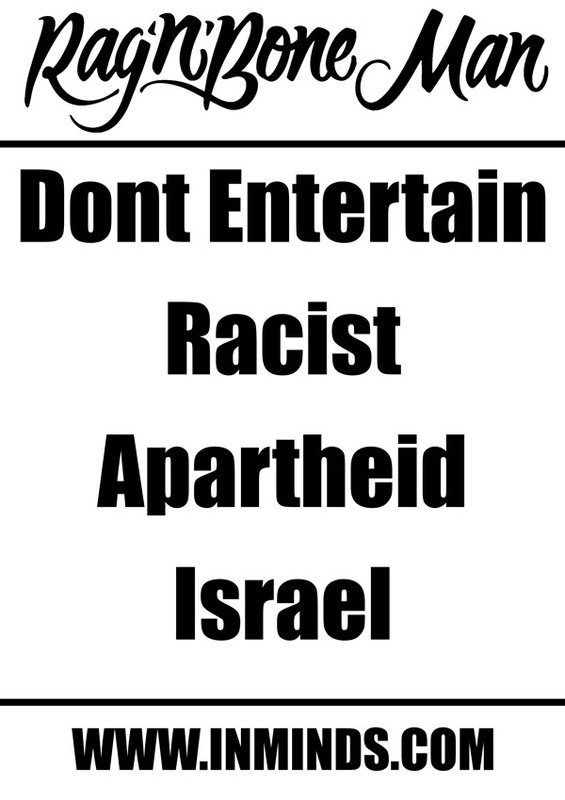 Just as South African anti-apartheid activists had called on international artists, writers and cultural institutions to culturally boycott South Africa in order to hasten the end of apartheid in South Africa, so in April 2004 Palestinian civil society called for a cultural boycott of Israel - for artists to respect this call and not perform in Israel. 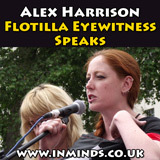 Inminds chair Abbas Ali said "In the 80s the United Nations compiled a black list of celebrities - from artists, performers to sportsmen who chose money over principle and appeased the apartheid regime in South Africa by ignoring the call of the oppressed to boycott apartheid. Their names are forever reviled as shameful supporters of racism and oppression. 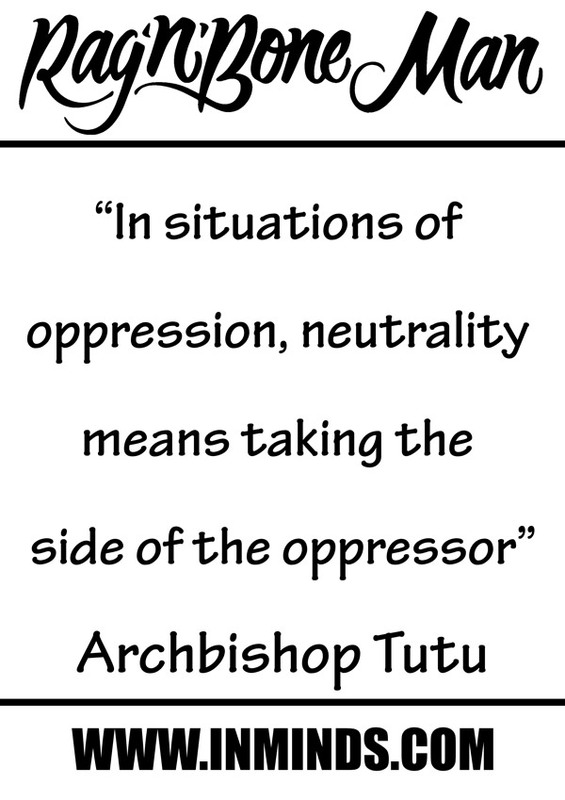 Today the oppressed are again calling for a boycott of apartheid and last month the United Nations started compiling another black list of those appeasing the apartheid regime in Israel, starting with companies complicit in Israel's illegal settlements built on stolen Palestinian land. Rag'n'Bone Man is a man of principle. We are here to remind him of those principles. 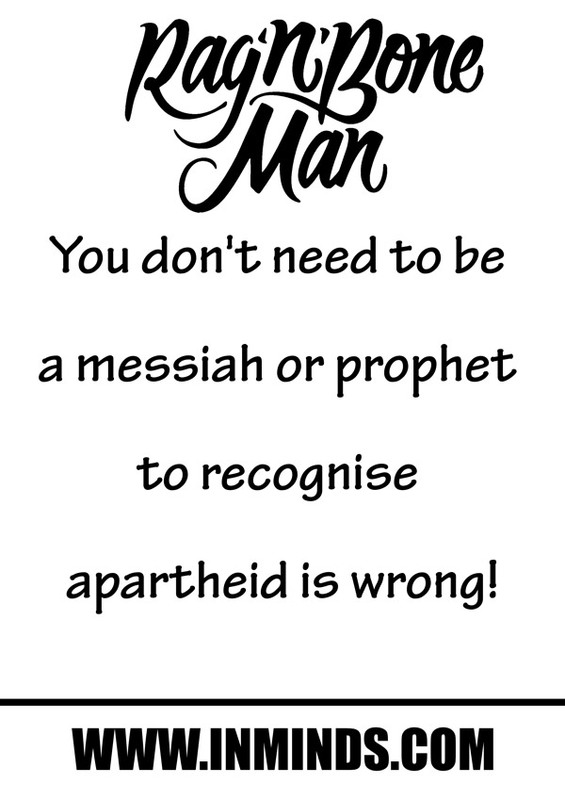 We urge Rag'n'Bone Man to stand on the right side of history and be remembered as an honourable man who put humanity before profit and stood up for the oppressed. 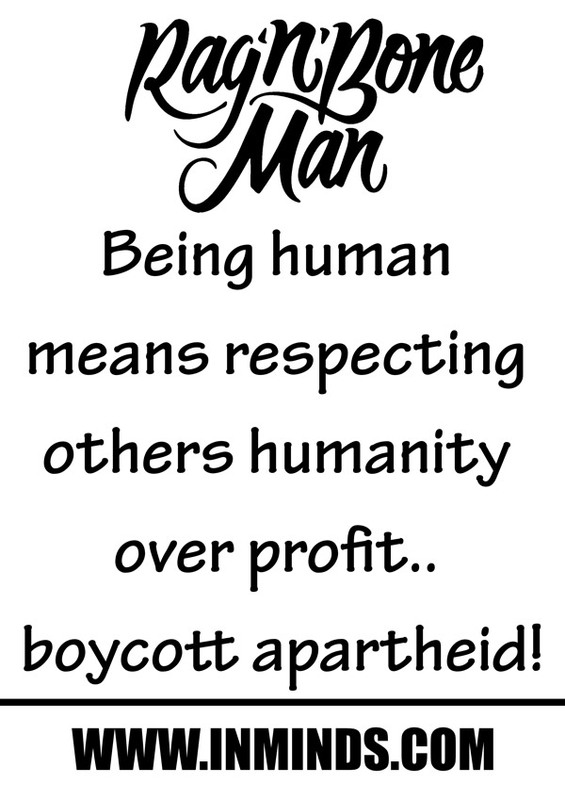 That, after all, is what being human means - putting humanity first."